Whether you need uniformed security guards for a special event, loss prevention services for your retail outlet, or a monitored whole-home alarm system, you can count on Optimum Security in Kelowna, BC to deliver professional, effective security solutions tailored to your unique needs. 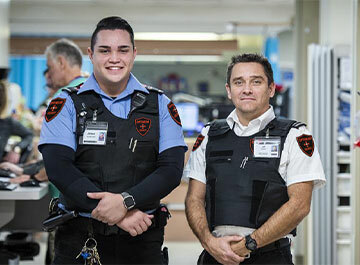 Our team of licensed and uniformed Kelowna security guards have all undergone rigorous background checks and training, making our security officers among the best-trained in the business. Our advanced home security systems are designed to offer enhanced protection for your Kelowna home or vacation property, even when you’re away. We design, install, and provide 24/7 monitoring for residential alarm systems that detect any unusual activity at your home, including break-ins, fire, smoke, carbon monoxide leaks, and flooding, while our two-way voice communication system gives you hands-free access to our Optimum Security monitoring team. Optimum Security provides customized protection services for special events throughout Kelowna, including private parties, festivals, weddings, grand openings, and conventions. Our professional security guards have extensive experience in dealing with crowd management, risk assessment, and protection for V.I.P. guests to ensure your special event is a success. Optimum Security in Kelowna works with a wide variety of industries to provide both comprehensive security services, including hotels, hospitals, schools, airports, gated communities and condominium properties. As the premier provider of full-service security solutions in Kelowna, we can protect you, your guests, and your assets with our multi-faceted approach to commercial protection. Our team of uniformed officers maintain a highly visible presence to deter theft, illegal entry, and unwelcome behaviour, while our mobile patrols and monitored CCTV systems ensure your property is protected 24 hours a day, 7 days a week. To learn more about our wide range of professional security solutions in Kelowna, BC, contact us at (604) 644-9229.